An 1862 monograph by pioneering French neurologist Guillaume-Benjamin-Amand Duchenne de Boulogne (1806-1875) is full of disturbing photos of human subjects. 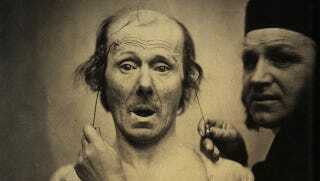 Using electrodes, the scientist triggered muscular contractions in their faces. You know, for science. The scientist was trying to figure out whether there was some kind of evolutionary basis for facial expressions, so he would shock various parts of his subjects' faces to see if he could regularly induce certain expressions. Top photo: Wikimedia Commons, others: Wellcome Library and Internet Archive.